A gowan is for ordinar Bellis perennis but micht be ony seemilar white or yellae flouer, tho maistlins some qualifee'r is pitten afore gowan for tae sinder thir flouers frae Bellis perennis. ↑ The source The Plant List used was the International Compositae Alliance. 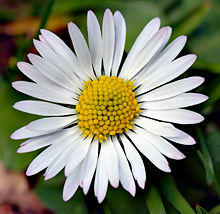 "Bellis perennis L". The Plant List; Version 1. (published on the internet). Royal Botanic Gardens, Kew and Missouri Botanical Garden. 2010. Retrieved November 12, 2012. Wikimedia Commons haes media relatit tae Bellis perennis. This page wis last eeditit on 12 Mey 2014, at 22:56.